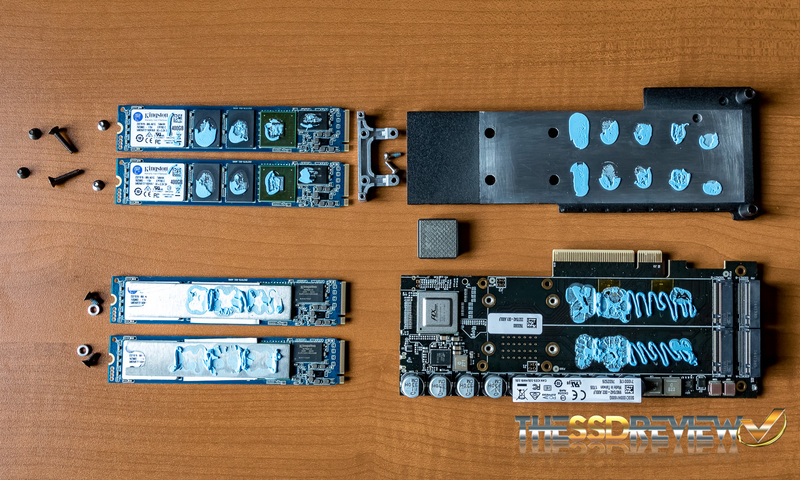 In a few recent articles at Tom’s Hardware, Paul Alcorn has summarized the latest roadmap and product visions from Samsung, including an upcoming new form factor to replace the Intel M.2 connector and QLC (Quad Layer Cell) SSD that could reach 100 TB drives. Finally, Chris Ramseyer takes a look at the new Samsung 960 EVO and 960 Pro NVMe drives. Some developments are clear: More data will be stacked in a smaller space, through 3D NAND, 16 bits QLC (Quad Layer Cell), and more dies stacked on top of each other. This will all result in lower prices per byte of storage. Obviously, it makes no sense to include a spinning disk in a laptop anymore, but the holy grail is the data center. There things are not so clear-cut. According to Alcorn’s article, Facebook is experimenting with QLC drives which could reach 100 TB. But there is of course no mention of price. What’s interesting, is that the newer drives, which use the new NVMe based M.2 controller has reset the downwards price trend. In one of the slides, Samsung points out that SSD storage is now at 36 US cents per GB. However, the latest 960 series are almost double that, at 64 cents. (512 GB for $329; 1 TB for $629; 2 TB for $1299). In comparison, the Seagate Archive 8 TB drives cells for $249 now, is 1/20 of that, at 3 cents per GB. In other words, Samsung has traded the 4x to 6x increase in read / write speed on the NVMe controllers for a doubling in SSD storage price. Now, Alcorn points out that there might be some margin to shave off there. Samsung has almost half the world market on both SSD drive and total SSD capacity shipments right now, but the competition is ramping up. 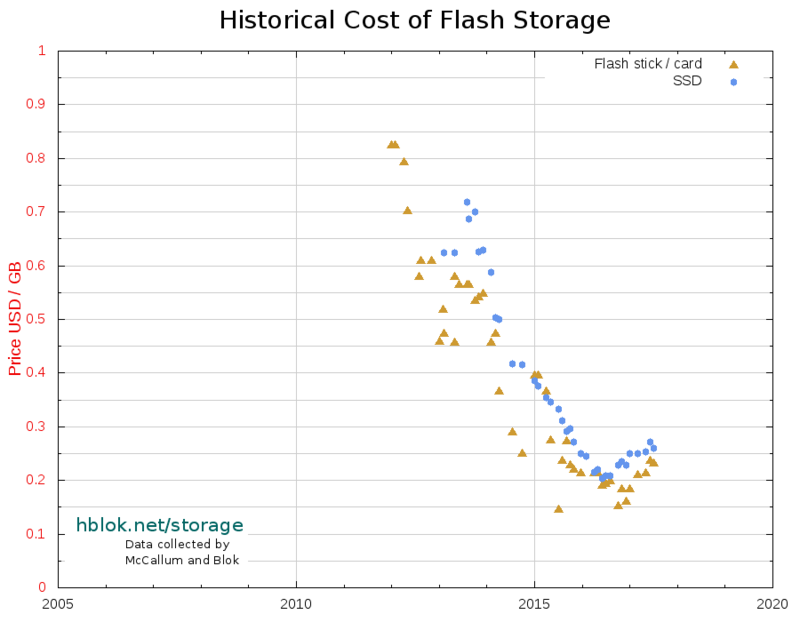 That we will see lower prices per byte on SSD in the next year is a given. As predicted in January, there have indeed been a number of exciting releases and announcements so far this year: Samsung finally launched their 15TB SSD; Intel brought 16nm TLC SSD to market; SanDisk (now owned by Western Digital) continue to launch faster larger SD cards; and a new large and heavy 8 TB USB 3.1 C external drive from Seagate was just made available. On the list below, there are also a few changes, including some new 8 TB disks from Western Digital. Prices are coming down a bit, but also due to currency fluctuations. Several 8 TB spinning disks are now very competitively priced. SSD drives are also coming down in price, and starting last year, more drives are now becoming cheaper per byte than optical media. That is of course mainly due to the fact that there has been no development in the latter technology, however, it’s a milestone worth noting since the next is in fact price parity with certain spinning disks. 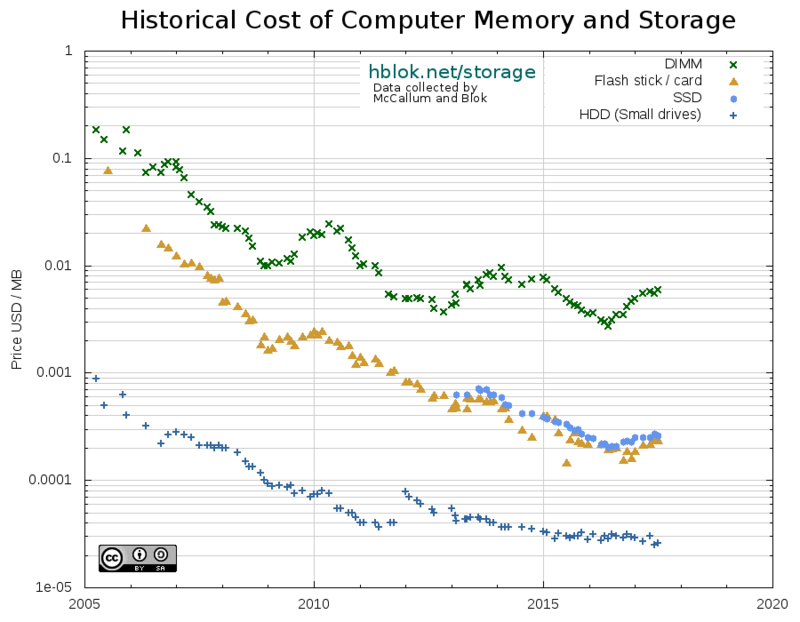 Where the gap has been 10x for the last decade (and still is for the cheapest HDD), it is now closing in more rapidly. Between the cheapest SSD byte and most expensive HDD byte the factor is now 3x-4x. Exchange rate: 1 Euro = 1.090000 CHF. There are number of new interesting storage alternatives on the market these days, and more are set to arrive throughout 2016. The large 8 TB SMR Seagate drives, both internal and external, top the list as most affordable per byte. They are followed by various traditional 3 and 4 TB drives. At the bottom amongst the HDD, we find the helium filled HGST drives. A 10 TB SMR version is expected to reach the market soon. In SSD land, the picture is reversed, where it is the largest drives which gives you most capacity per coin, at continuously decreasing prices. Added to the mix, is the new NVM-M.2 motherboard socket standard, which attaches directly to the PCI bus. This gives vastly improved performance, at up to 5x read/write speeds of the traditional SATA3 connection. Finally, amongst flash card and stick storage, there is similar prices decrease as SSD, and also increase in max size. The biggest SD cards are now at 512 GB. Exchange rate: 1 Euro = 1.100000 CHF. During 2015 there have been considerable progress on both storage and memory fronts, including larger capacity, faster SSD drives and finally a shift to DDR4 DIMM. 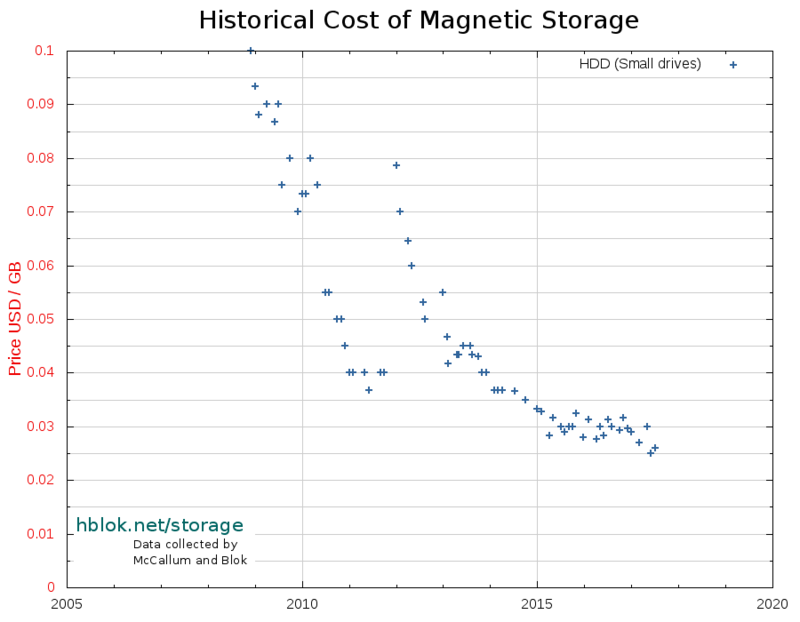 However, the 30 year old logarithmic trend in declining magnetic storage prices is distinctly broken. 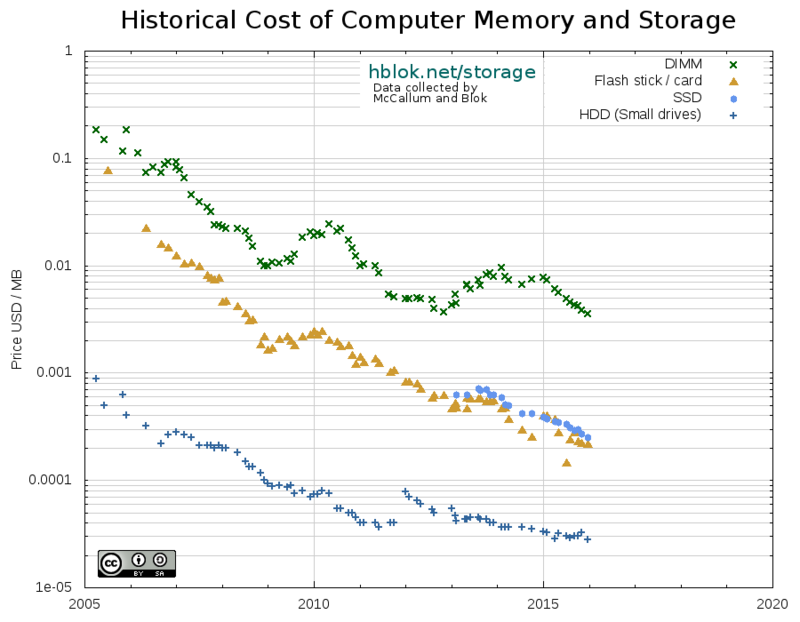 In fact, this year there has been little movement in price / byte at all for HDDs. For magnetic drives, HGST announced the biggest yet 10 TB Ultrastar Archive Ha10 drive. Interestingly, it combines the 7 platters helium filled technology with Shingled Magnetic Recording (SMR). As such, it is in the same niche as the Seagate 8 TB Archive 6 platter archive drive. The helium drives are still expensive, but the Seagate SMR drives is close to the top of the list of price / byte. 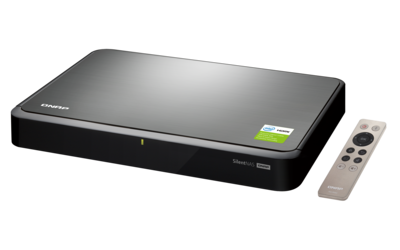 However, for now it is beaten by the conventional Perpendicular Magnetic Recording (PMR) Toshiba 5 TB PH3500U-1I72 drive, so there is no need to split out the SMR technology in the charts below. Also a first, is Samsung’s enterprise SSD drive, PM1633a, which at 16 TB beats the special magnetic archive drives by a considerable margin, but of course also in price. More obtainable are the new breed of PCI NVM Express drives which increases the read/write speed far beyond the 6 Gbit/s SATA 3 barrier. The Intel 750 Series 1.2 TB drive is specified at 2500 MByte/s (20 Gbit/s) sequential read. See here for the updated data and charts, and detailed information. That page is becoming a reference point, so I will put in more effort to keep it up to date. Although the prices on medium sized, 3 to 4 TB, spinnings disks remain about constant since the beginning of the year, a new drive has jumped right to the top of the list this time: The Seagate ARCHIVE HDD 8TB at 260 Euro or 0.03 GB Euro per GB (30.6 GB per Euro). This drive is not for everybody, though. It’s using Shingled Magnetic Recording (SMR) in “drive managed” mode, which means it’s a write-a-few-times / read-many drive. 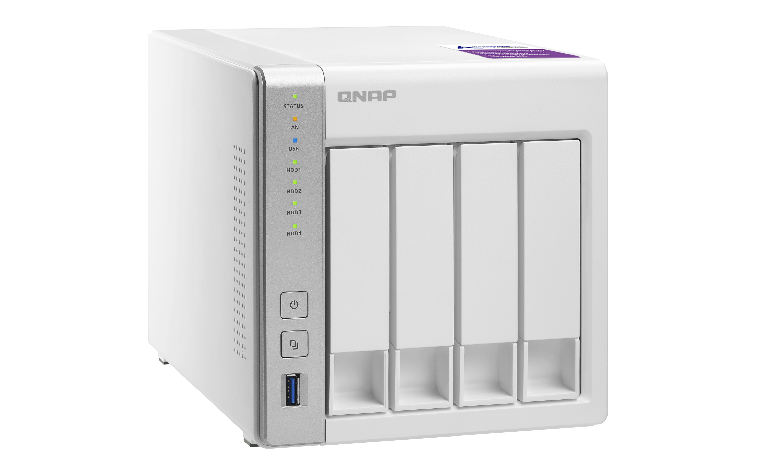 Or in other words, well suited for a large movie collection or as its name suggest large backups in single disk mode. It is specifically not designed for RAID mode. This review goes into further details. What’s interesting, is that it’s a 6 platter (1.33 TB platters) drive, without any other special hacks to make that work. 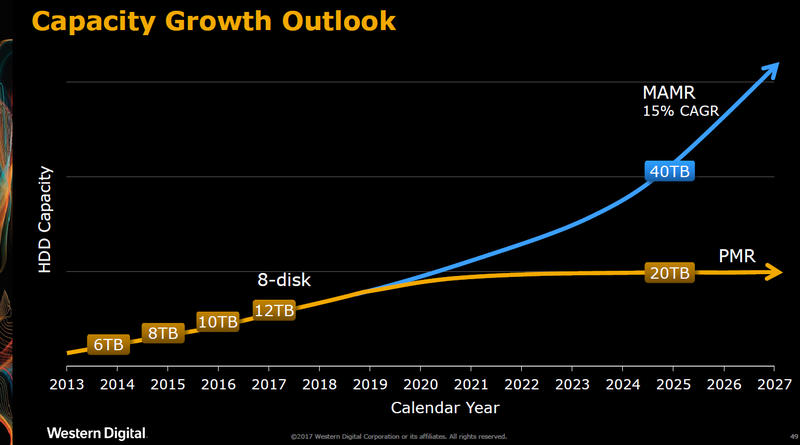 If the same disk goes to 10 TB by next year as hinted earlier, it will mean 1.67 TB platters. Contrast that to the Hitachi HGST Ultrastar Helium 8 TB drive at the opposite end of the HDD price spectrum. At 800 Euros, it’s more than three times more expensive than the Seagate 8 TB drive. The HGST uses helium to pack 7 platters into one drive, and needs a special seal to keep the light helium gas inside. It’s still an unproven technology, and only time will tell if it really works. Given the very high price over even 6 TB “normal” drives, it’s unclear which market segment would bet on this drive. Maybe it’s still priced at “early adopters” premium. In the SSD section, Samsung has moved to the 850 series in both EVO Basic and Pro lines. 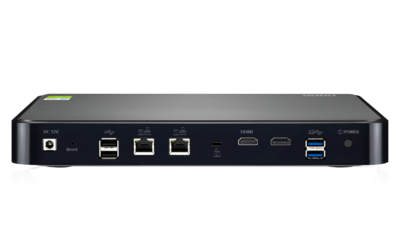 Crucial has launched new BX100 and MX200 MLC lines. The new BX100 line gets overall good review in this Anandtech article. 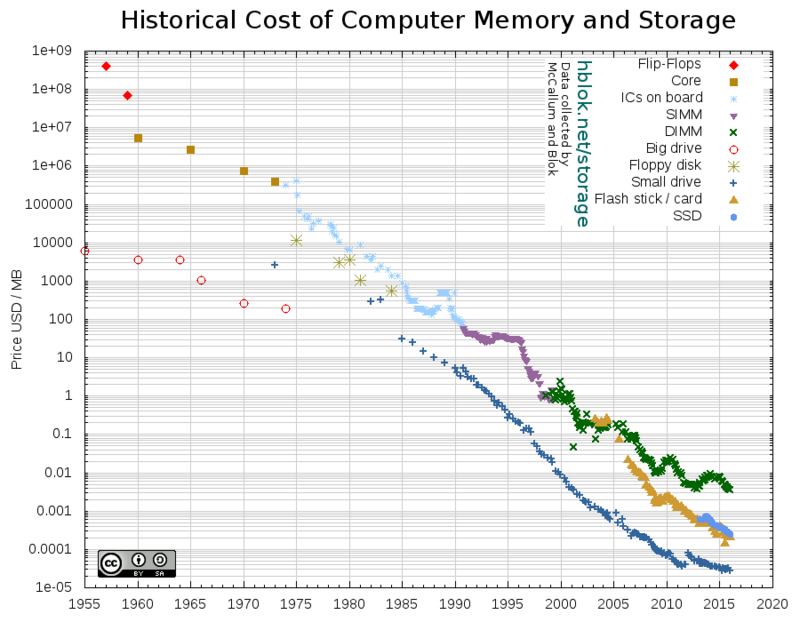 Prices have not changed significantly, and the larger drives still give the most bytes per coin. The 500 GB drives are now excellent laptop upgrades if you’re still on spinning disks. Finally, on flash cards I’ve also added micro SD, and a good selection of alternative SanDisk SD cards. Except for size, the distinguishing factor on these cards is read and write speed. This SanDisk article explains the Class and UHS ratings. It’s nice to see that the cards it makes most sense to buy for the average consumer are also towards the top: For your phone (if it has a memory slot) a 64 GB Sandisk Ultra microSDXC Class 10, 48MB/s at 43 Euro should be a good investment. While for your mid-range DSLR a 64 GB Sandisk Extreme SDXC, Class 10/UHS 3, 40/60MB/s at 50 Euros will give lots of space and good burst rate even with raw files. Exchange rate: 1 Euro = 1.040000 CHF. 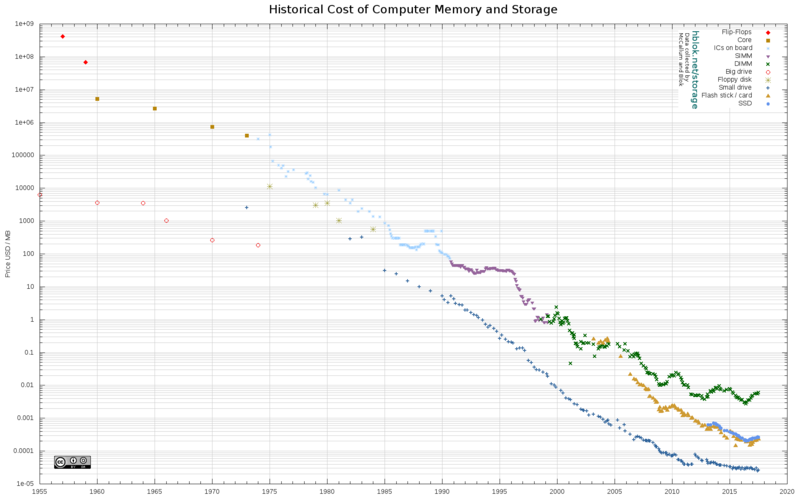 Since last September, there have been only minor changes in most storage prices. Some have actually gone up, and most price changes are due to currency exchange rates. 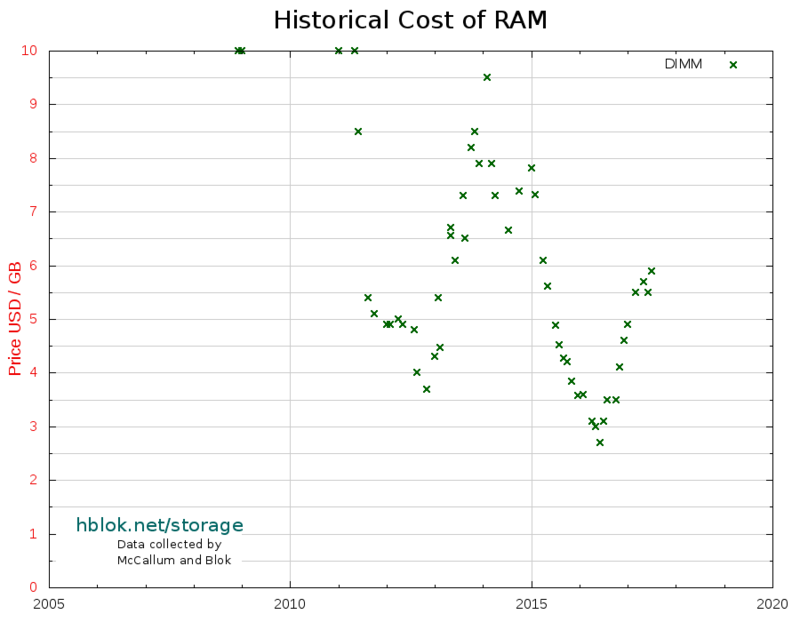 For spinning disks, 3 TB still gives most bytes per coin, and the 1 TB disks are now rather poor options. I will probably remove them in the next iteration, as it makes little sense to buy these models. On SSD, bigger is also cheaper, and 512 GB models possibly the best for a laptop drive now. For a OS drive in a desktop with an extra disk, 256 should be fine. Finally, on flash cards, some older versions have been removed. The remaining are fast and competitively priced. Exchange rate: 1 Euro = 1.010000 CHF.